Wasp infestation is no laughing matter. Wasps are aggressive and fiercely protective of their nests. Their stings are incredibly painful and certainly lethal for those who are allergic to them. These are not the only thing you have to worry about. Unlike bees, wasp stingers don’t stay lodged on their poor victims. They can attack you as many times as they want. This is why it is essential that when you spot wasps within your premises, you immediately secure the help of our pest control experts from Langley, Surrey, or Vancouver. A single wasp can cause severe damage once it locked on its target. Imagine hundreds of them near or—worse—in your home. That paints a pretty alarming picture right? Think You Have a Wasp Problem? Not Sure if You Should Call Langley’s Pest Control Experts? Here’s the thing though: seeing a wasp or two passing through your property doesn’t necessarily mean that you have a nest in your grounds. So, take measures to confirm your suspicions. 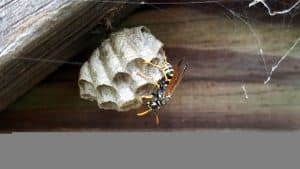 To help you figure out if you should just carry on or immediately call our experts for pest control in Langley, Vancouver, or Surrey, we’ve put together the most telling signs that there is wasp infestation in your property. Let’s say; it’s the weekend. You’re lazing around your house when, out of nowhere, a wasp comes passing through the room. Where did that little guy come from? How did it get into your home? Pay attention. If you see more of them buzzing through your home, then you can start getting worried. This is the most alarming sign that you have wasps living in your walls. True, there’s a possibility that you just left a window open or there are holes in your exteriors. But would you take that chance? Follow your unexpected guests to find out where they came from. If they disappear to one of your house’s interior walls, do not hesitate to call our experts for wasp removal whether in Vancouver, Langley, or Surrey. If you can’t see them, you can probably hear them—especially if there is a serious infestation. So, tone down your television or take off your headset and listen. Some pets have a bad habit of chewing wooden furniture. But if you don’t have any pets, then you should start looking. Check the wooden surfaces of your home’s interiors and exteriors. Examine your window and door frames. If you see tiny unexplainable holes and tunnels, consider calling our specialists for wasp removal in Vancouver, Langley, or Surrey. Wasp nests are usually built on sheltered and out-of-the-way places that are easy to access outside. So, check the nooks and crannies of your garden shed and garage. Look into your home’s wall cavities as well as the small spaces under the eaves and roof. Wasp nests look similar to a beehive but have a more paper-textured appearance. If you find a wasp nest, don’t waste time, and call a wasp removal professional as soon as possible. Have you confirmed that there are wasps nesting near or—worse—in your home? Then, don’t waste another second. Contact us now, and get Langley’s best pest control services right now!